UVic Women in Science presents an interview series highlighting women in the scientific community on Vancouver Island. Dina Buric is a third year PhD student in the Pure Mathematics group in UVic’s department of Mathematics and Statistics. In her work she is able to tie together two of her passions by exploring the concepts of mathematics that can be intrinsic to diverse forms of art. 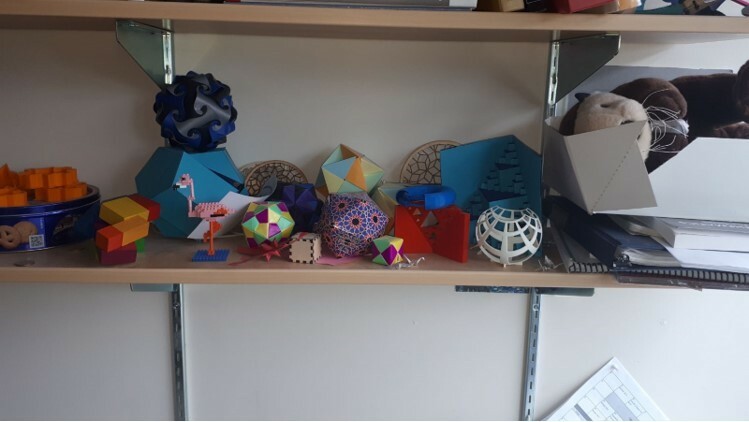 Dina has used this connection to help others understand the mathematical aspects of art through the creation of beautiful physical mathematical models, as well as collaborating to create a course at Western Washington University that addresses this connection. What is your field of study and what stage of your education/career are you at? My field of study is mathematics and I am currently working with dynamical systems. I’m in the third year of my PhD program. When did you first become excited about science? I’m not sure when I first became excited about science. I’ve always been excited to learn; I remember being a little kid, before starting elementary school, and collecting pencils and notebooks, eagerly waiting to start school. Throughout my K-12 education, I was always slightly embarrassed about liking school so much. I liked science in particular because it was nice to be able to ask a question about the world (like why do crystals look a certain way), and find a partial answer to that question. That felt very empowering. How did you get to the position you are in today? Was it a straightforward career trajectory? What are your current career aspirations? My career trajectory was not very straightforward. My first university was the University of Washington, and I went there with the intention of majoring in architecture. I was interested in the connections between math and art and I thought that architecture would be the perfect blend of these two subjects. While I was pursuing an architecture degree, I found myself more interested in the engineering and mathematics courses I was taking at the time. I remember spending much more time immersed in the material of my mechanical renewable energy course, which was an elective, than my core design courses. As I took more engineering courses, I began to realize that it was the underlying mathematical ideas that I found the most fascinating. That’s when I realized that maybe I should be working on a math degree instead. I still liked design, I just preferred to view design from a mathematical perspective. I transferred to Western Washington University in Bellingham, WA (where I grew up) with the intention of majoring in applied mathematics. For some reason, I had it in my head that mathematics should always be applied to something. As I took more and more math courses, I realized that mathematics is interesting and creative in its own right and that I wanted to study pure mathematics. I ended up staying at Western Washington University for my master’s degree in mathematics and then taught as a sessional instructor at WWU for three years after that. While I was teaching, I started to miss learning higher level mathematics, so I decided to apply for PhD programs. Now, I feel very lucky that I got a chance to go back to school and study mathematics in such a beautiful place! Describe your research focus. My current research focus is in dynamical systems. A dynamical system involves how a system changes over time. A typical example is a pendulum, or the position of the planets. Some systems are predictable, others are not so predictable and are called chaotic. I’m currently working on connecting three different chaotic dynamical systems in a special way. One of the dynamical systems involves a tiling space of aperiodic tilings. Aperiodic tilings are tilings that don’t have any translational symmetry but still have some order. These have applications to the study of quasicrystals. One of the aperiodic tiling spaces I study are made up of tiles from the Rauzy fractal (shown below). I find these types of dynamical systems especially interesting. The Rauzy fractal - an example of an aperiodic tiling. What do you enjoy about this field/your work? I enjoy the ideas in mathematics the most. For example, the idea of a fractal to me is just so beautiful. I also find it kind of neat that fractals are a bit elusive to mathematicians in the sense that it is hard to pin down a definition of a fractal. One example of a fractal is the Sierpinski triangle. You start with a triangle and a simple rule: divide it up into four similar triangles by connecting the midpoints of the sides of the original triangle, and then kick out the middle triangle. Reiterate this rule by doing the same thing to the leftover triangles. If you think about reiterating this infinitely many times, you will get what is called the Sierpinski triangle. Can you believe that this object has zero area but INFINITE perimeter? How crazy is that? To me, this is such an interesting idea - one simple rule can produce something so mind-boggling. Although I don’t work with the Sierpinski triangle directly, it is discovering mathematical ideas such as the Sierpinski triangle that get me excited to go to work everyday. Sierpinski’s triangle: This object with infinite perimeter yet zero area was a key concept leading Dina to her current work focus. What have been the obstacles for you during your education/career? Do you believe any of these were specific to being a female? I think my main obstacle was not believing in myself. I did not have the intention of pursuing a master’s degree, and it was one of my professors who originally asked me to think about the idea. When I was taking a Mathematica/Matlab course during my undergrad, the professor, Donald Chalice, gave us a challenge problem to write code to create a three dimensional version of the Sierpinski triangle. I liked the idea so much that I stayed in the computer lab working on it after class. It was very exciting when the code actually worked and I ran over to my professor’s office to show him. When I showed him my code he got just as excited as I did! I think it is always encouraging when your teachers get sincerely interested in your work. I took his Analysis class the following year and, during that class, he offered to write me a recommendation letter for graduate school. I hadn’t really considered graduate school as an option until he brought it up with me. In the end, I asked him to be my Master’s supervisor. Something similar happened when I was teaching. I had the intention of applying to graduate PhD programs, but I was feeling very discouraged. It had been a couple of years since I was out of school and frankly, I felt like I had forgotten quite a bit. It was another professor, Arpad Benyi (he was on my advisory committee) who ended up meeting with me several times and was very active in helping me apply to PhD programs. I think that women tend to underestimate their abilities, so it is possible that my self-confidence is a reflection of that. I’m really not sure. But, I do believe that it is important to pay attention to students’ ideas, acknowledging their work and encourage them to keep learning. Have you had any strong mentors during your career? Do you think mentorship is an important component of professional development? I think that mentorship is absolutely vital. I have mentioned two professors that have encouraged me to pursue graduate school, and I have had quite a few other mentors help me with teaching. The Association for Women in Mathematics also had a great mentorship program. My mentor strongly encouraged me to talk to Ian F. Putnam who is now my supervisor. It is important to me to have people that I can share ideas with and ask for advice, especially people who have already been through or have guided others through a similar experience. How do you balance your hectic work/school schedule with your life? What are your interests outside of school? Oh, I don’t think I do the greatest job of balancing my work schedule with my life. I’ve been getting better about this, but I have a tendency to blend the two to the point that work becomes my life. I’m a bit of a hermit. In the past year, I’ve noticed that this type of lifestyle has taken a toll on both my physical and mental health. So, I’ve been trying to make sure I see friends more often, I have been pushing myself to exercise more, and mostly, I have been trying to take time to appreciate the place I live in. I have been exploring the area much more, going on hikes, riding my bike more, and I went skiing on Mt. Washington this past winter. Gosh, that place is beautiful. Did you know that you can see the ocean from the mountain!? There are whisky jack birds there and they will just swoop down and land on your hand. I discovered this when one first landed on my helmet. I do like art. I wouldn’t call myself an artist by any means, but I’m most passionate about trying to make some of the mathematical ideas that I learn about come to life in some sort of tangible form. The main purpose of this is to be able to better communicate a mathematical idea. Most of the time this is done through a computer software program, such as Mathematica, where I create an image or an animation. After I create an image, I try to figure out what materials I can use to create a physical object that someone can hold in their hands. Typically, I have been 3D printing or laser cutting these objects, but I have also used string, origami, straws, etc., whatever I can think of. Imposter syndrome (phenomenon) is quite prevalent in female scientists. Is this something you’ve observed during your career? Do you experience it? What do you think we can do to counter it? Yes, I have observed this throughout my career. For example, while doing this interview, I have been thinking that there are much better women scientists at UVic that you could be interviewing instead of me. Because of this, agreeing to this interview was difficult for me. For me, the best way to counter it is to focus on the fact that I really enjoy mathematics and to be thankful for the fact that I have been given a chance to pursue a career in it. So, I have been trying to focus on how thankful I am that UVic Women in Science chose to interview me and that they gave me a chance to share some of my quirky mathematical objects. What has been your greatest accomplishment in your education/career? My greatest accomplishment in my career would have to be helping create a Math and Art class with my colleague Teresa Downard at Western Washington University. The class took quite bit of effort to formulate. We wanted students to gain a deeper appreciation of mathematics using connections between math and the arts. We wanted the class to reflect the beauty and creativity of mathematical ideas by using visual arts, dance, music etc. What are you still hoping to accomplish? I would like to keep exploring ideas in mathematics and continue to try to find ways of sharing them with others. How do you contribute to supporting female scientists that are following in the same path as you? I think that it is important to recognize and support others’ hard work and accomplishments. I try to do that as much as possible. I think this is especially important if someone is working hard but still struggling. A lot of times people just need someone to believe in them. I don’t think this is really female specific. One way I do this is through T.A. work such as tutoring and leading tutorials. I also try to go to as many colloquiums and student talks as I can. One of the graduate students, Chris Bruce, organizes a graduate seminar every term. I think this is great because graduate students are welcome to give talks in a very low pressure environment. The purpose of the seminar is to learn from each other, so the talks often turn into discussions where everyone is given a chance to speak. Regularly getting together like this is a great way to show support for each other’s work. What programs/events would you see as being most useful for women in science here at UVic? First of all, I really love what UVic Women in Science is doing for the university; this is a great way to connect and support female students in science. Being able to meet other women in science and listen to their stories is really motivational. I’m not sure how the logistics of this would work, but being able to have some sort of mentorship program would be nice as well. The mentor could be a grad student or faculty member. Having a strong support system for female undergraduates in science could be very beneficial. Sometimes being one of the only women in a classroom can feel isolating, and hopefully having a mentor can make someone feel less alone. Lastly, for students planning their lives outside of university, it would be useful to have an event that invited UVic science graduates who pursued careers outside of academia to come speak about their current careers. Personally, I would love to hear about what types of jobs women in science chose to pursue after receiving their diplomas or degrees. What advice would you give to students and young females interested in science? My main advice would be that if you enjoy science, you should keep doing it. I think it is good to be a little bit stubborn. Even if you think that your grades are not high enough or you’re not the smartest student in the class, that doesn’t really matter, just keep going. What really matters is your passion for the subject. I believe that this is what has gotten me through some of the tough times and has been the driving force that keeps me coming back to learn more.